The SV-500 Series has been discontinued. Please see the SV3321 Series as a possible alternative or contact our Flow Engineering department. 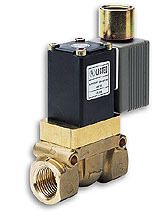 The SV-500 Series of 2-way normally closed internally piloted piston solenoid valves have an epoxy-encapsulated coil. These valves feature a brass body, PFTE sealing material for main seat, FKM O-rings and core seals, and a temperature range of 0 to 100°C (32 to 212°F). SV-500 Series valves are ideal for neutral media such as compressed air, hot air, water, and oxygen, and for use in breweries, fire prevention systems, water supply, and air conditioning installations. Electrical connection is by conduit plug. The maximum pressure for the UL listed valves is 355 psi.